In 1993 the Houston Press Music Readers Poll included for the first time categories for individual instrumentalists as well as types of bands. 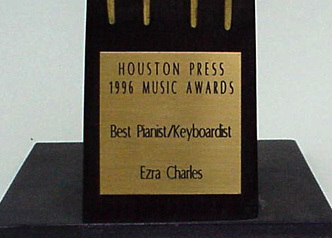 The first winner in the new Best Piano/Keyboards category was Ezra Charles, referred to as "Master Pianist" in the Houston Press award ceremony write-up. 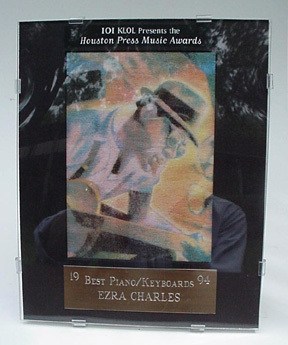 When Ezra won his second Best Piano/Keyboardist Readers Poll Award, the Houston Press called him "the Paul Schafer of Houston," in reference to the band's Rockets gig and stated,"Ezra Charles has made his mark on Houston many times, and in many ways, over the course of a long career. ".........and this was in 1994! 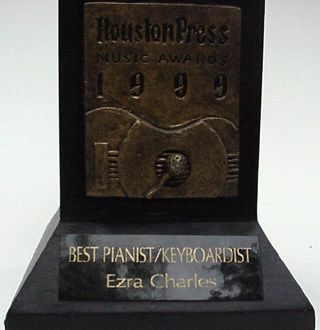 In 1996 Ezra was nominated for Best Piano/Keyboardist in the Houston Press Readers Poll again, and won. In 1998 The Houston Blues Society invited the band to participate in a city-wide Blues Talent Search. Preliminary rounds were conducted at four different clubs to narrow the entries from about eighty bands to twelve finalists. After winning a first round at The Big Easy, at the final contest at Dan Electro's, Ezra Charles and His Band were voted the Third Place Award by the judges. 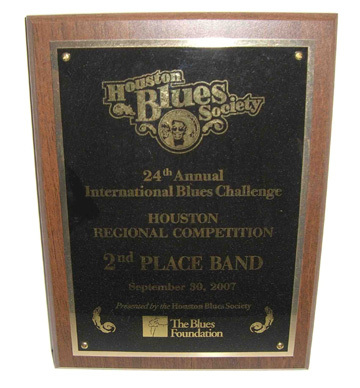 In view of the fact that practically every blues talent in the Houston area was represented in this contest, the band was delighted to be named to the top three. 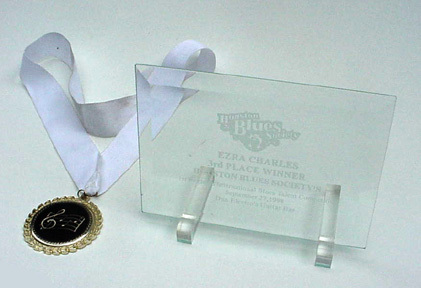 In addition to the etched glass plaque, the award also carried with it a Star-Wars style neck ribbon and medallion awarded on the spot, which Ezra insisted on wearing out to the victory dinner that night. 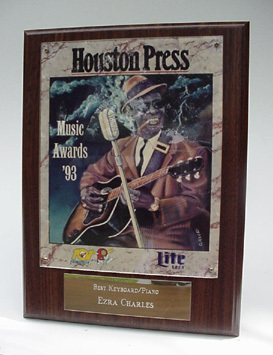 1999 brought yet another nomination and win for Ezra in the Houston Press Readers Poll. This is one heavy piece of sculpture weighing in at about ten pounds! 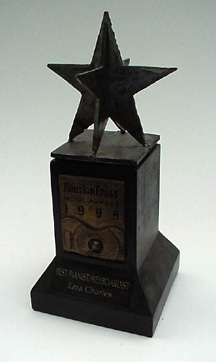 2004 brought yet another nomination in the Houston Press Readers' Poll. Ezra won again for Best Piano/Keyboardist, making his record perfect: Nomination = Win. Ezra didn't show up for the awards ceremony, and the unclaimed trophies were stolen! The Press had duplicates made, but there is a clone out there somewhere.... 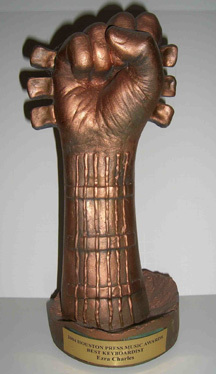 Unfortunately, this trophy is even uglier than the comments the Press usually has for Ezra's talent. By 2007 the band was ready to get back in the Blues Contest business again. This time we moved up to Second Place. 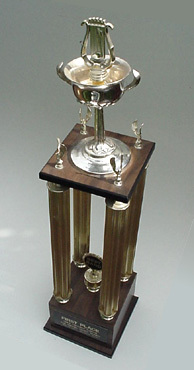 In 2008 the band entered again, and made the Finals of the Houston contest, but no trophies were awarded for the runner-ups, and places other than first actually weren't even announced. 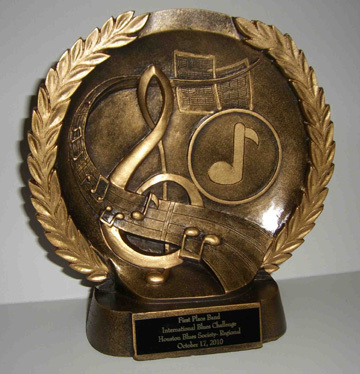 FINALLY, in 2010, the band got it all together and won all rounds in the Houston Blues Society contest, sending us to Memphis in Feb. 2011 where we advanced as far as the Semi-Finals against 110 bands from all over the world. Here's the most bizarre trophy in our collection. 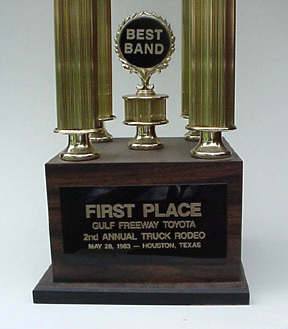 Way back in 1983, the first year of the band's existence, before the band even had a horn section, we were invited to participate in a band contest sponsored by Gulf Freeway Toyota. It was kind of a pushover, since we were essentially the only professional act that showed up. Still, we got a trophy that stands about 3 feet high, and $1000 for our efforts on a very hot afternoon.